Share price of Snap, Inc. SNAP dropped to a new 52-week low of $8.90 yesterday, eventually closing a tad bit higher at $9.20. The dismal performance can be primarily attributed to the sequential decline in Snap’s daily active users (DAU) in the second quarter of 2018. Its DAU decreased 2% sequentially to 188 million. North America DAU was 80 million, down 1.2% sequentially. Management stated that the sequential decline was due to the lower usage of the Snapchat application, primarily due to the redesign, which received significant negative response. The decline is a concern as it makes the platform less attractive to advertisers. We note that advertisements contribute significantly to the company’s revenues. Notably, Snap has lost 37% of its value year to date against 26% rise of its industry. Lackluster user growth remains the primary concern for investors. The company’s focus on the younger demographic poses a lot of challenges. Snap undoubtedly is quite popular among that demography but its failure to attract the older generation (above 34 year olds) has been a negative. The company’s lack of popularity in the international quarters is also a big concern. We believe Snapchat needs to focus more on the global market and target other age groups in order to stay ahead in the competition. 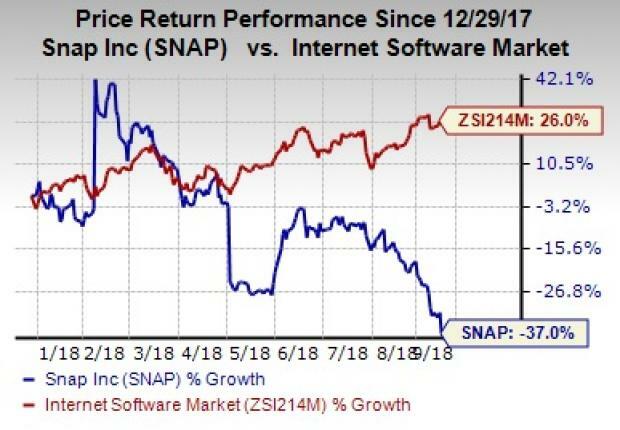 Moreover, lack of revenue diversification is a major concern for Snap. Advertising is its only source of revenues. Additionally, stiff competition from Facebook FB for advertising dollars does not bode well for the company. Nevertheless, Snap’s strategy of bringing in new features to attract more users and advertisers is a positive. It is also the most preferred social networking medium among teenagers, which is a tailwind. j2 Global, Inc. JCOM and Paycom Software, Inc. PAYC are two better-ranked stocks in the broader sector. Both of them sport a Zacks Rank #1 (Strong Buy). You can see the complete list of today’s Zacks #1 Rank stocks here. The long-term earnings growth rate for j2 Global and Paycom Software is projected to be 8% and 25.5%, respectively.